Over the last decade or so, it’s become increasingly clear that Nintendo doesn’t care about the Wario Land series. Indeed, with 2008’s Wario Land Shake It being the last game released in the series, it’s been over a decade since anything has been seen of the franchise. And with poor representation elsewhere, a shift to WarioWare and a lack of interest in talking about the series, it’s obvious that Nintendo sees Wario’s time as a badass treasure hunter as something to relegate to history, a relic they have no interest in beyond the odd Virtual Console release. But hope isn’t lost here. No, because while Nintendo may not seem to care about the Wario Land series, at least one enterprising individual definitely does. Known only by the name Pizza Tower Guy, he’s the developer of a fantastic looking spiritual successor by the name of Pizza Tower. It’s a title that aims to recapture the feel of the classics, and bring back the style so beloved of Wario Land 4 and other great Wario platformers. So if you’re interested in hearing about it, the people behind it and the hopes they have for the new franchise, keep reading! Starting with a bit of a personal background info. Who’s working on this game anyway? 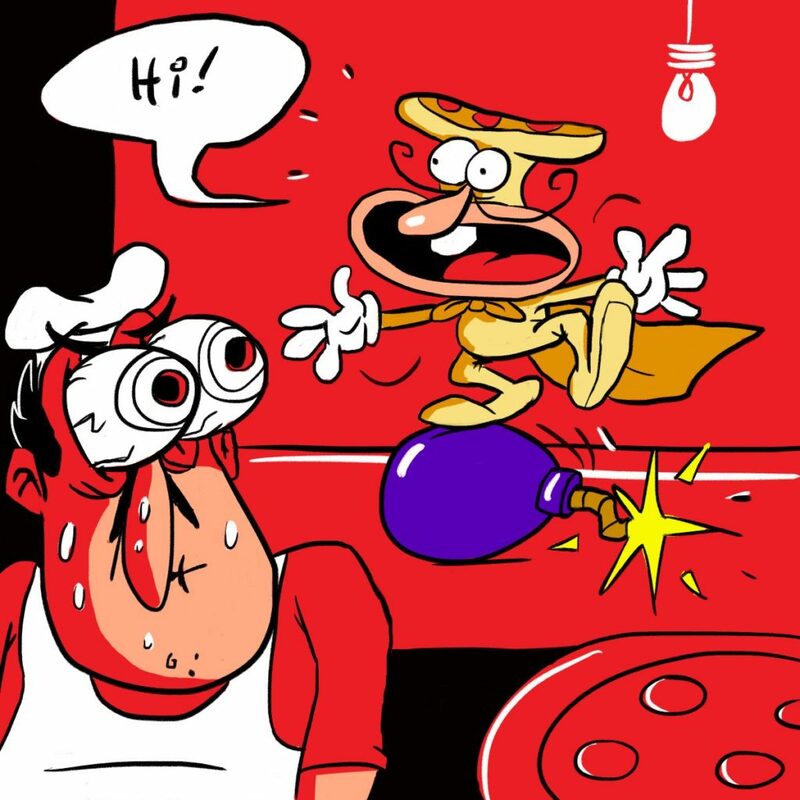 I (Pizza Tower Guy) am doing the programming and animations, Sauceman and Frostix are doing the soundtrack and sounds. At first I was completely alone, but they eventually joined in when the project started getting attention. I recruited Sauceman when he sent me a first version of “Pizza Time”, which is the escape theme. I thought it sounded perfectly insane and dynamic like I wanted it to be, so I asked him to join the team to compose other tracks. Frostix was just a guy that popped in on the discord server and made a bunch of remix of the music Sauceman made, so I asked him if he wanted to join and he did. Aside from that, I have a dedicated discord server that’s pretty eager to giving me tips and feedback. And how did you get started in gaming anyway? What was your first game? The first console that I owned was a Game Boy Advance. I had SpongeBob: The Movie game, Pac Man Collection and Mario & Luigi: Superstar Saga. From then on I kinda just hopped mostly from Nintendo consoles to another. I know this is going to sound surprising, but I never played any Wario Land games until a few years before I started making Pizza Tower. My first Wario game was Wario: Master of disguise on the DS, which is arguably the worst Wario game. Caption: Though give it credit, the music was nice. What about game development? How did you get interested in that? I had a lot of game ideas that I scribbled down, going down to specific mechanics and all that. I just never got down to doing any of it because I thought I didn’t have the means to do it. That’s why at first I did a couple of attempts at making games in RPG Maker, but it was so limited that I couldn’t get the animation quality that I wanted. However, it turns out that Game Maker is pretty easy to get into and seeing other people do small-scale projects in it made me interested to give it a shot. I watched tutorial videos and started applying them to a Weenie Cop game where you played as a hot dog that fights junk food criminal. It was all over the place in the gameplay department because it wasn’t very well conceptualised, but it helped me on understanding how Game Maker works. After that, I got a very specific idea of making a Wario Land type game where the main mechanic is the R-dash button. I decided to apply my Peppino character to it and it sort of happened. What other games have you worked on before this one? None. I am basically learning as I’m making it. Either way, it’s clear Wario Land provided a decent bit of inspiration here. Did you have a lot of experience with that series? More or less, I recall playing Wario Land 4 a lot more times than the other games. I did finish all of them somewhere in last year to get a good view of where I should be going with Pizza Tower. I wouldn’t say I am the most experienced Wario Land person compared to speedrunners or the guy that wrote a 582 pages book on Wario Land 4 design, but I know what it’s about. Feel disappointed Nintendo stopped doing anything with it after 2008? I think everyone who likes those games is. Shake It wasn’t exactly the best revival for the series in my opinion. What aspects of the Wario Land titles were your favourites and why? If we are speaking in an overall sense, the different forms that Wario can take is a very unique and fun idea. 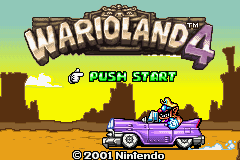 I think each individual titles has its own feel and charm, but Wario Land 4 is the one that really stuck with me. The music and visuals are just intense and crazy. Wario’s movement options makes him versatile and fun to move around. There’s just a lot of well executed ideas in that game that are out of the ordinary. And hey, if you ever did get lucky enough to work on a Wario Land sequel, would you make it? Sure, but the task would be a level above what I am trying to do with Pizza Tower. Onto Pizza Tower itself now. Why Pizza Tower? Where did the name come from? It’s basically the Leaning Tower of Pisa, which is in Italy. Pisa is almost worded like Pizza. That’s really it. Panic Restaurant and Burger Time did it first, but I agree that’s it’s not very common. Peppino (the main character) origin is kinda weird. The character was created from doodles/comics where he imagines pizza creatures appearing in his restaurant at night. The first game idea with him was a side-scroller RPG with survival horror elements where he would fight pizza monsters while trying to navigate his giant restaurant, Resident Evil style. It still had the cartoon animations and all that, but it was much darker, sort of like to Courage the cowardly dog. 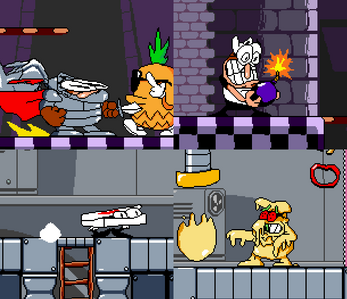 After learning bits and pieces of Game Maker, I decided to toy around with the idea of a battle system where Peppino used a Pizza cutter chainsaw that works like Wario’s R-dash. I then dropped the idea for Weenie cop, then returned back again to this R-dash thing but instead made the whole game more Wario Land-ish. I did that mostly because I was scared to start a game with no direct piece of reference. 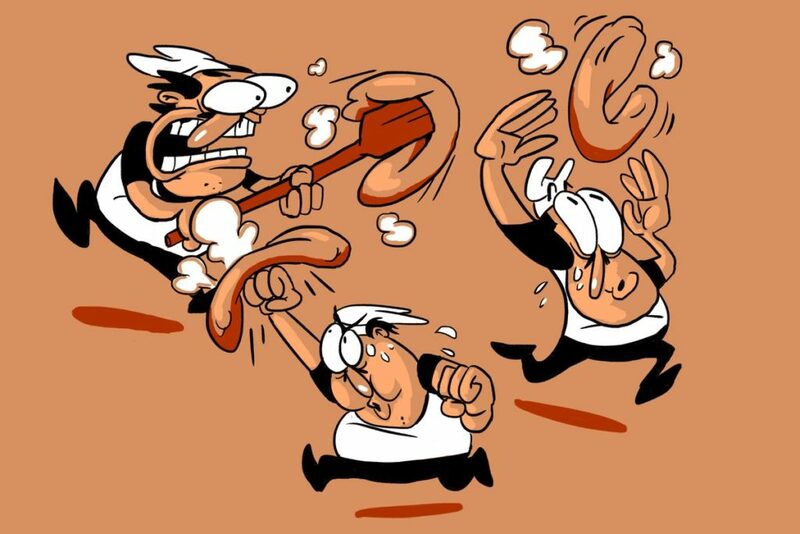 The overall idea is still about the same, a scared crazy pizza man fighting pizza monsters. As is the art style in general, which reminds me of golden age cartoons. What inspired that style anyway? I watched a lot of SpongeBob and read a lot of French comics as a kid. I didn’t really choose the style as much as it is the only style that I am competent at pulling off. It’s easy for me to draw like this quickly, but also animate quickly. That way I am not scared if the characters are drawn exactly the same proportion-wise and I can give them a lot more of fluid motion. I think it’s a good way to make your game stand out. Indie games are a bit oversaturated with low resolution SNES/NES type pixel art games, it’s hard to tell them apart sometime. Pizza Tower falls in the pixel art category but I think the style and resolution is high enough to make it feel distinct. Back to Pizza Tower itself now, how did you come up with the main character’s design anyway? There really is not much thought process behind the characters and enemies I draw, I make it up as I go along. I think Peppino was just fun to draw and relatable enough in his character traits, maybe that’s why he stuck. Peppino colours are what I actually put more thought into, because he is actually coloured like Wario from Wario Land 3, if it wasn’t obvious enough that this game is Wario Land inspired. His pants were made an all-black solid colour so he would be easier to animate. Yes, he’s the character archetype that can take a beating for sure, kinda like Wario. His goofy nature works well with the cartoon violence. The story isn’t very well developed because I wasn’t sure if I even wanted to have a story in the first place. It changed it a bunch of times to fit with new main mechanics or levels themes. The gist of it now is that Peppino is trying to find the secret ingredients in the pizza tower to make the best pizza for his failing pizza restaurant. What about the villain? Who’s ‘The Noise’? He is an obvious The Noid bootleg, I thought he would make a perfect villain in a pizza themed game. Maybe that or a Hatsune Miku bootleg. Either way, The Noise is simply a mischievous gremlin trying to impede on Peppino’s quest because he thinks it’s fun. He’s a bit like the Noid, except evil! How about the level design style? So far it seems to be very Wario Land 4 esque, but what’s the general feel you’re going for here? Wario Land 4 with more focus on the R-dash mechanic maybe? I was scared when making the level design at first because I realised Peppino controls very differently from Wario in WL4. He has an air-dash now, can do a Super Metroid shinespark and needs a lot of start up space to execute his dash. So basically I can’t design the levels exactly like a Wario game, because Peppino is versatile and just different. But for the overall level progression, I simply took Wario Land 4 frog switch mechanic because it’s probably my favourite idea from that game. That and the transformations puzzles are the most similar aspect for the level design. Can you spoil us on a few interesting ideas you’re working on for later in the game? I don’t think I have much to spoil since I am very upfront with my community about where I am in the game development. I show about any bit of new content that was integrated in the game. I could say that I am currently working on making more interesting boss fights. One thing Wario Land games always had a large focus on was collecting, with getting thousands of coins opening new endings and other secrets. Is that gonna be a thing here too? Yes, collecting is going to be an important aspect of Pizza Tower. 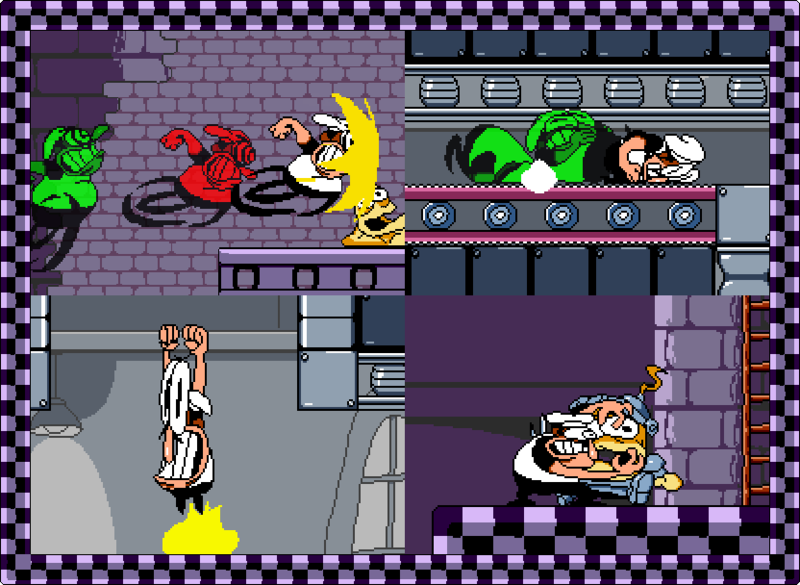 Different endings depending on performance is a given, since that’s a staple of the Wario Land series. Exploration won’t be a focus like Wario Land 2 or 3 but it will still be present for sure. I never planned for this game to get any attention at all, so I never gave much thought to that. But overall, I will continue to show updates on the game and keep handing out demos for people to try out, since it seems to be working pretty well so far for me. What consoles do you plan to release the title on? Could the Nintendo Switch be on the cards? For now I will focus on getting it done for PC, then maybe try to get it on consoles. How about other computer operating systems like Mac OS or Linux? Same thing, I will try to make it at least functional for one platform for now! Either way, any success will probably lead to a sequel or follow up of some kind, right? What would be next after this? Some sort of WarioWare successor? Honestly, I think I would tackle that survival horror game I had first conceptualised with the same character, but who knows. This is way too early for me to think about this. Finally, what would you say about this game to get anyone on the fence interested in it? What’s the hook that’ll hopefully get people interested on Steam? Well, if you like platformers, Wario Land, pizza or cartoon animation, check it out. Agreed. What’s more, we’d advise everyone else here to do likewise. Because Wario Land needs a spiritual successor. It needs a Bloodstained or Hat in Time or Wargroove. It needs something that shows Nintendo that yes, the fans are indeed interested in Wario as a badass treasure, and that’d they’ll support a new game should one be released. And Pizza Tower is exactly that. It’s a fantastic looking indie game that brings back everything we loved about Wario’s platforming adventures, and one that could become a surprise smash hit when it releases in a few years’ time. So check it out, give Pizza Tower Guy your support and follow the game’s progress on social media. If you do, you’ll both help out a promising indie title and prove to Nintendo that interest does still exist in the Wario Land series itself as well.